South Gyeongsang Province Gov. Kim Kyoung-soo is to be grilled by the independent counsel investigating allegations surrounding blogger “Druking” on Thursday. The investigators believe that Kim Kyoung-soo colluded with blogger Kim Dong-won in using illegal software to conduct an online campaign to influence public opinion in favor of President Moon Jae-in in last year’s presidential election. The investigators believe that Kim Dong-won and his associates demonstrated the software being used at their office in Paju, Gyeonggi Province, in November 2016. Gov. Kim is also suspected of having recruited the blogger to influence online opinion before the June 3 local elections. Gov. Kim was subjected to a marathon 18-hour questioning session Monday, during which he denied all allegations. Following the interrogation Kim claimed he does not believe the special counsel has secured sufficient evidence to prove his involvement in the wrongdoings of Kim Dong-won. The special counsel, however, is said to be confident of proving Gov. 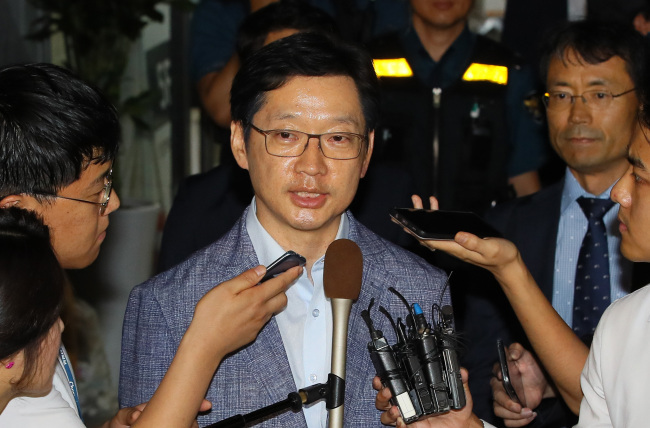 Kim’s involvement, and is reported to be weighing its options in applying for a warrant to detain him after the second interrogation session. According to reports citing unnamed sources close to the governor, Kim is said to have told investigators he was present at Druking’s office in November 2016, but that he was not shown the software in question. The governor also reportedly claimed he was simply shown the organizational chart of the community operated by Druking. The investigation, which has cast doubt over the political career of one of Moon’s closest associates, also appears to be dividing the ruling Democratic Party of Korea. Democratic Party chairman candidate Rep. Kim Jin-pyo on Wednesday reiterated his position on Kim Kyoung-soo and Gyeonggi Province Gov. Lee Jae-myung, further highlighting internal friction concerning the two governors. Speaking in a radio interview, Kim Jin-pyo claimed Kim Kyoung-soo is “a man who would not violate the law,” while stressing the controversies surrounding Lee are of a different nature. Kim Jin-pyo has been calling on Lee to sever ties with the party over alleged wrongdoings, including links to organized crime. Kim Jin-pyo’s rival Rep. Lee Hae-chan, meanwhile, criticized the party chairman candidate for taking different positions on the two governors, saying the party must wait until investigations into the allegations are concluded.